Dirty Kanza brings out a massive group of cyclists that have different backgrounds, new goals in mind and overall mainly cyclists looking for a challenge. Speaking of new goals we had the opportunity to sit down with Rebecca Rusch where the 7X World Champion has already won the Dirty Kanza 200 three times and now looks to embark on the new 350 mile event here in Emporia. Other then training for long distance events Rebecca keeps herself busy with her own event, Rebecca’s Private Idaho Weekend which takes place August 31st – September 2nd. 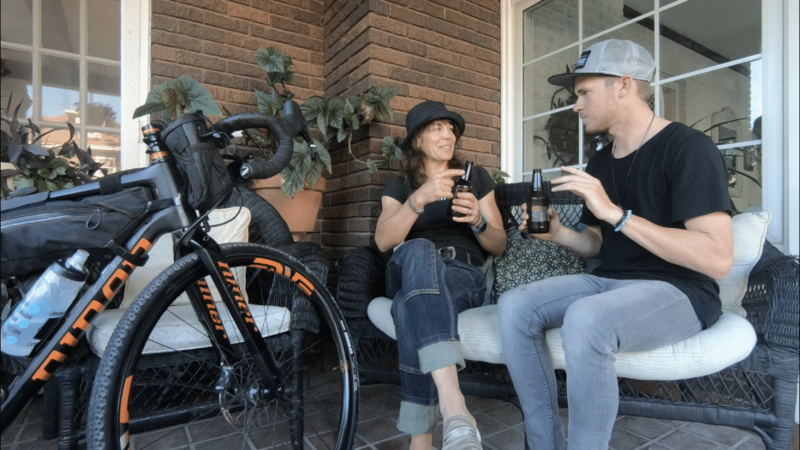 Listen to our interview below where we chat it up with her preparations on her upcoming big ride, how she set up her bike to handle the excursion and everything else she is up to. Rebecca’s Niner ride is set to go for her 350 mile adventure. Her tire choice will be the Maxxis Rambler 38c. Her top tube is well equipped with an extra bag for snacks and goodies. With no course marking Rebecca will have to rely on her Garmin GPS mapping. To relive her 350 miles, Rebecca will be capturing the good times and struggles of her big ride. Her front hub is a self generating power source to keep all of her gadgets charged up. USB ready to charge her lights and Garmin from her front power charging hub. Rebecca will be riding the new Enve G series gravel specific wheels that were introduced here at Kanza.